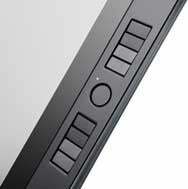 Wacom has introduced a new version of its Cintiq 21UX, a redesigned update of its interactive pen display. It features enhanced pen performance and improved ergonomics for professional photographers, designers, artists, and animators. The new product carries the same name and nearly the same specifications as the previous version, but it offers a number of updated features. The new Cintiq 21UX, which is now black in color, will cost $1,999 and will begin shipping in the United States, Canada, and Mexico by early April. The Cintiq 21UX Grip Pen features Wacom’s proprietary Tip Sensor technology, offering users what the company calls near-zero (one gram) starting pressure. “Now, pressure-sensitive support can start with an incredibly light touch, emulating the same organic feel, response, and result derived from working with traditional brushes, markers, and pens,” said Don Varga, Wacom’s senior product manager. The new Cintiq pen features 2048 levels of pressure sensitivity, doubling the resolution of the previous pen’s pressure curve and improving the accuracy of pressure-sensitive effects, such as controlling line weights or opacity adjustments. The Grip Pen also has a pressure-sensitive eraser and two side switches that can be customized for commands such as double-click and right-click. This new display features an updated ergonomic design. The customizable, application-specific ExpressKeys, eight located on each side of the display’s bezel, are designed to help improve workflow and boost productivity by making commonly used commands readily available. Pressing the top ExpressKey brings up an on-screen display showing the settings of all the ExpressKeys and Touch Strips. The close proximity of these tools to the work area improves efficiency and comfort. It also helps save time by minimizing dependence on the keyboard without taking focus away from the pen hand, according to Wacom. Also new is the introduction of two user-defined, four-function Touch Strip Toggle buttons. 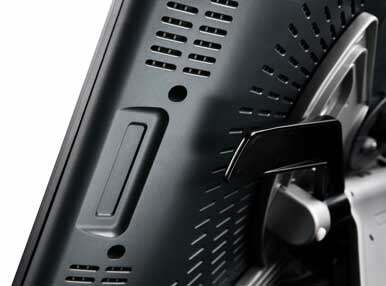 These control the function of their associated Touch Strip, which is ergonomically positioned on the back of the bezel. The position of an illuminated LED located along the perimeter of the Toggle button indicates the current function of the Touch Strip. The Touch Strips, which are application specific, can be used for up to four functions—such as zoom, scroll, brush size adjustment, and canvas rotation—per application. This new treatment allows users to toggle with their thumbs while using a forefinger or middle finger to control Touch Strip speed and variation. The Cintiq 21UX’s stand lets users set the pen display at any angle between 10 degrees and 65 degrees to match their working posture. The new Cintiq also can be rotated up to 180 degrees in either direction to accommodate natural drawing movements or a different viewing angle. Users can also remove the Cintiq from the stand to use on a table top, or to attach it to an articulating arm (not included) using the standard VESA (Video Electronics Standards Association) mounts located on the back of the display. A new weighted pen stand doubles as a twist-off storage compartment for pen nibs and the nib removal tool. Standard, felt, and stroke nibs are included. 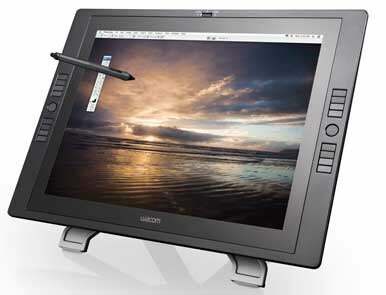 Besides Wacom's driver software, which includes radial menus for quick “pen-point” access to additional customized shortcuts, the Cintiq 21UX ships with Corel Painter Sketch Pad, plus Nik Color Efex Pro 3.0 WE6 and Wacom Brushes 3.0, plug-ins for Adobe Photoshop and Photoshop Elements. The new tablet works with OS X 10.3.9 or later.